The title of Rae Armantrout’s poem “Thrown” immediately brings to mind philosopher Martin Heidegger’s notion that human life is thrown into the world. This concept plays a key role in his book Being and Time, and I’ll return to Heidegger a little later. But I’d like to begin by looking at the poem through the lens of James Longenbach’s essay “Poetry Thinking,” focusing in particular on a couple of passages that address the way Shakespeare’s characters speak their thoughts. Dwelling (the R.V. ), language, and thought are all implicit concerns in this section, and these are also subjects Heidegger elaborates on in his writing. The connection between Dasein (human being) and the earth is especially important to Heidegger, and his essay “…Poetically Man Dwells…” looks at the importance of poetry and the “concentrated perception” with which the poet takes the measure between earth and sky. At one point in the essay he says “Poetry does not fly above and surmount the earth in order to escape it and hover over it. Poetry is what first brings man onto the earth, making him belong to it, and thus brings him into dwelling.” To be thrown into the world, in Heidegger’s philosophy, means, in part, to be aware of one’s own mortality; and the closing image in Armantrout’s poem, despite its bright yellow expansiveness, also has something terminally reflective about it. In this part of the poem a linguistically attentive, fleet-of-thought phenomenological awareness comes to rest on an ultimate horizon. 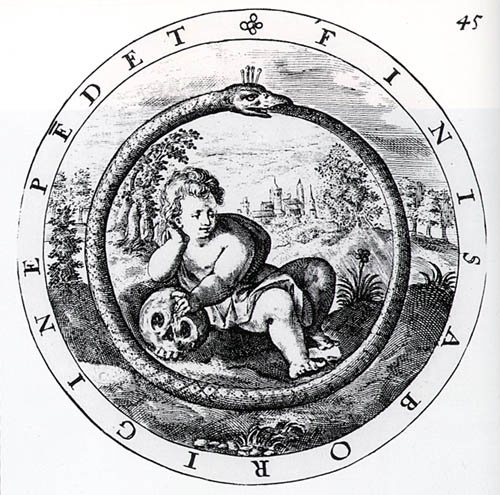 So, ouroboros or slithering serpent? In part 1 of “Thrown,” the speaker throws herself forward like a serpent building upon the fulcrum of itself, though the culmination of this thought sequence is an unavoidable sense of completion, of having come full circle. In part 2, her thought again moves restlessly forward but this time evades any imposed sense of closure; instead, her concentrated perception finds itself in an open field where she dwells as a poet, taking the measure of earth and sky. Maybe a poem has to have it both ways. Certainly, the reader of the poem wants to see it ultimately cohere. 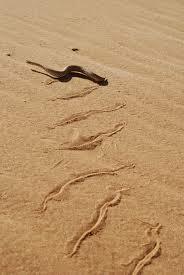 But a poet can’t help but admire the muscular and serpentine progress of the sidewinder, whose track itself forms a stanza-like series of lines in the sand. James Longenbach’s essay “Poetry Thinking” is in his 2013 book The Virtues of Poetry. Martin Heidegger’s “…Poetically Man Dwells…” can be found in his collection Poetry, Language, Thought.